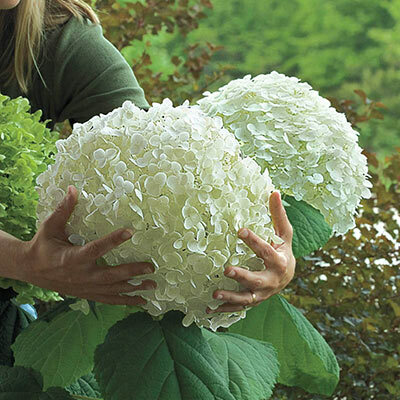 Incredible 12" bloom heads are held on stems so strong that drooping is never a problem — even after a rainstorm! A descendant of the beloved classic, Annabelle, it is blessed with stronger stems, and flowers that are bigger and much more numerous. It blooms from early summer until fall, and it blooms on new wood, so you can count on blooms even after very cold winters. Keep evenly moist and prune to 12" in late winter. 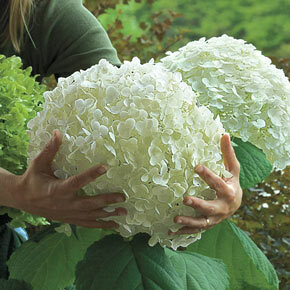 Hydrangea arborescens 'Abetwo' PP20571. Winter Care: Mulch to maintain soil moisture, plant in sheltered site. Foliage Type: Medium green ovate leaves. Soil Requirement: Moist well drained moderately fertile soil. 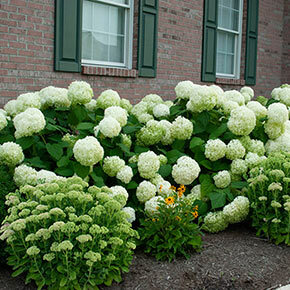 Additional Information: This is a new improved 'Annabelle' hydrangea. Huge spherical flowerheads. Four times as many flowers as Annabelle. Stems strong enough to hold up the big flowers even in a rainstorm.